The Carpenter Ant is one of the most destructive structural pests in the northwest United States. Carpenter Ants have an evenly curved "thoracic dorsum", this is the back of the insect. The most common member of this family is Modoc; it is black with reddish colored legs, but color is not a good indicator as some types have red parts. These ants are often found moving along foraging lines about 1 foot apart. Trees, fences and firewood are all regular paths that they are known to use. Carpenter ants will damage homes by nesting in them. The will dig out tunnels in wood to expand their living spaces and can lead to structural damage. The infestation in the home usually is a satellite colony, with the main one within a hundred yards or more in a stump or other decayed wood. When colonies start to establish themselves in homes, they may start small (a few hundred members) but can grow to several tens of thousands. There can be 20 or more satellite colonies. Take care when storing firewood. This is a favorite nesting location for Carpenter ants. Always keep wood elevated and covered from the rain. A wet pile of firewood in contact with the ground is an ideal infestation location. Stumps left in the yard are common locations for colonies. Never allow plants to make contact with the home. Trees and shrubs provide natural paths for insects and are frequently foraging sites. It is a conducive condition for pests when wood touches soil. Wood should rest on concrete or other suitable support, and when it is in direct contact with the ground pressure treated lumber is recommended. Beauty bark or other landscaping is often piled too high next to homes. This can lead to rot/decay and lead to a Carpenter ant infestation. Crawlspaces and attics need adequate ventilation to keep the moisture content low. If the ventilation is not adequate, there will be biogrowth (mold, mildew or fungus) and create conditions that encourage infestations. Vapor barriers are recommended in crawlspaces. This will help keep the framing under the home dry and provide a barrier to discourage pests. Check for holes in the exterior of the home, where pipes and electrical wires enter. Doors, windows, foundation cracks, siding and trim are all common locations for ants. Seal these areas with caulk or other suitable materials to discourage entry. 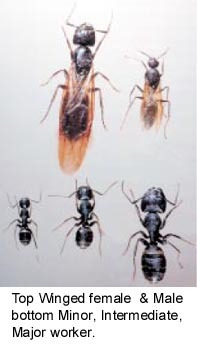 WSU Extension Bulletin 0818.CARPENTER ANTS: THEIR BIOLOGY AND CONTROL, L. D. Hansen. Carpenter Ant Update, PCT Magazine April 2002, L. D. Hansen.